SMi are delighted to have our Chairman, Speaker and Workshop Host, Justin Mason-Home, Director, HPAPI Project Services Limited, onto the speaker panel for HPAPI 2018! Justin Mason-Home is an organic chemist with extensive health, safety, environmental and chemical engineering experience in senior technical, legal and commercial aspects of the pharmaceutical, biochemical, chemical and other industries. He has held senior positions and worked globally in potent biopharmaceutical occupational health and safety global environmental consulting, board level positions in a biotechnology company and corporate environmental management. Justin has worked on multiple ADC projects and specialises in technical complex and strategic projects, including unique experience in managing sensitive highly potent and toxic biopharmaceutical compound matters. SMi are excited to have interviewed Justin about his talk and career experience. Q. 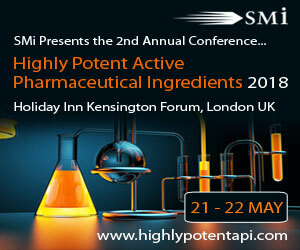 How is your organisation involved in Highly Potent Active Pharmaceutical Ingredients? Q. What technology or platform updates have really caught your eye in the past couple of years? Q. What are the future challenges for the advancement of HPAPIs and what do you think are the biggest hindrances to achieving the utmost therapeutic potential of HPAPIs? Q. Which markets are you looking to collaborate with in the future? – Pot Pourri; Risk Assessment, QA and H&S conflicts, Pitfalls and more! Learn key HPAPI project elements, what factors are important and how to build information designed to underpin HPAPI project investments. All too often companies and their advisors, design and deliver HPAPI facilities based on “emotion” and guesswork. This workshop will try to ditch the emotion and provide a pathway to systematic and scientific project design. For those looking to attend there is currently a £100 early-bird saving, ending March 29th.